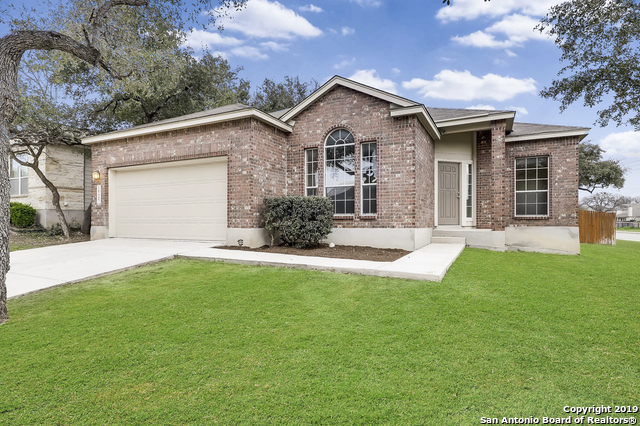 All ENCLAVE AT LAUREL CANYON homes currently listed for sale in Helotes as of 04/20/2019 are shown below. You can change the search criteria at any time by pressing the 'Change Search' button below. "Well maintained, two-story Helotes home minutes from plenty of shopping, dining, and entertainment! Easy access to Loop 1604 and Lackland AFB. Large master and secondary bedrooms upstairs with a guest bedroom and full bath down. Walking distance to the community park and pool. Brand new laminate plank flooring in downstairs living area and roof replaced within the last two years." "4 bedroom 2.5 bath single family home with two car garage. Hurry, this great deal won't last long!" "Impeccable curb appeal, filled with modern amenities, this traditional home is a total charmer. The 3 beds, 2 full baths & flex room offers space for a private office, extra bed, media, or playroom. Entire residence boasts upgraded floors. The spacious master is filled with natural light & has a walk-in closet. The kitchen features new quartz counters & stainless appliances. A banquette dining area is the perfect functional & transitional space to the vast covered patio. Contiguous & convenient "
"This home is an entertainers dream! This well cared home is ideal for all your entertainment needs. You and your guests can enjoy dining on the outdoor patio under the softly lit umbrella of lights. This home is truly turn key ready with all the amenities to meet you and your family needs. This includes refrigerator, washer, dryer, water softener, custom master closet, hanging garage storage racks and all on a greenbelt. Within minutes you can be in Old Town Helotes, major shopping, restaurants "
"Beautiful 4bd 2ba 2car Single Story Home located in Enclave At Laurel Canyon by 1604 & Braun Rd -Lowest Priced Gem in Helotes TX! Granite counter-tops & SS appliances in kitchen. Engineered hard wood floor & Tile throughout, no carpet. Roof & Water Heater replaced in 2016, HVAC in 2017. Fridge & pergola convey with the property. Covered back porch & pergola provide a great space for your outdoor pleasure. Manageable yard. Owner Financing option available. Come see your future home today before i"